Do you remember Tad Schroeder? 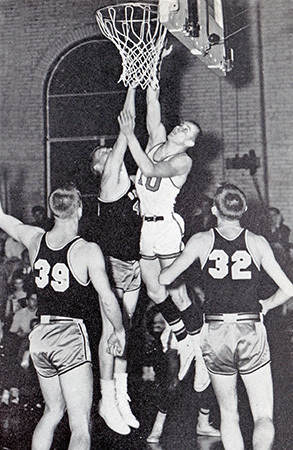 Tad Schroeder graduated in 1954 and was inducted into the Hall of Fame in 2013. From 1952-1954, Tad Schroeder won 3 Letters for Baseball, playing first base and second base. He won 3 Letters for Football, playing quarterback, defensive back and punter; and 3 Letters for Basketball, playing Forward. He also won 3 Letters in Swimming and 1 Letter in Track, running the 880 and mile relays. Tad was President of his Class and Fraternity. At the University of Cincinnati, Tad studied A&S, was a Sigma Chi President and a member of Ulex and Sigma Sigma Honorary Groups. 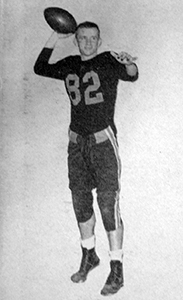 Tad played football under Sid Gilman as a quarterback, defensive back and punter, played 3B for the baseball team in 1956 and made the swim team in 1958.